If you’ve tried all-liquid detoxes or juice cleanses, and suffered fatigue, headaches, and moodiness only to have the weight you lost (mostly water!) creep back, there’s another way to rev your metabolism and jumpstart a clean-eating lifestyle. 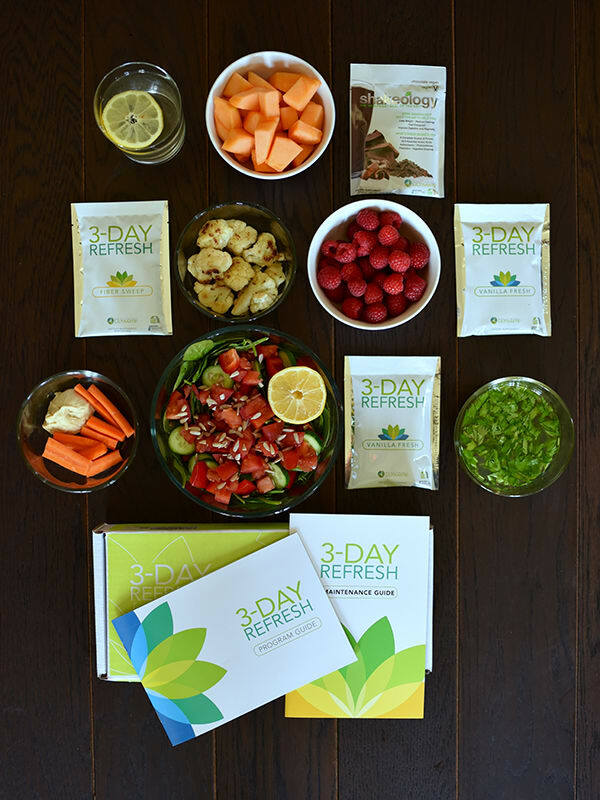 3-Day Refresh combines three specially formulated shakes, plus one fiber drink with whole foods to help you de-bloat, squash cravings, and start eating nutritious foods like vegetables, fruits, and healthy fats. Filled with plenty of nutrition, fiber, and good-for-you fats, this plan is short enough to make it doable in any circumstance — even if you’re traveling. Best of all, you don’t have to sit miserably at the dinner table with a cup of liquid while your family or friends enjoy a satisfying meal. You get to eat real food with them. Roast the asparagus and cauliflower. See preparation directions below. Make the Veggie Stir-Fry. See prep directions below. Next, build the spinach salad. See prep directions below. 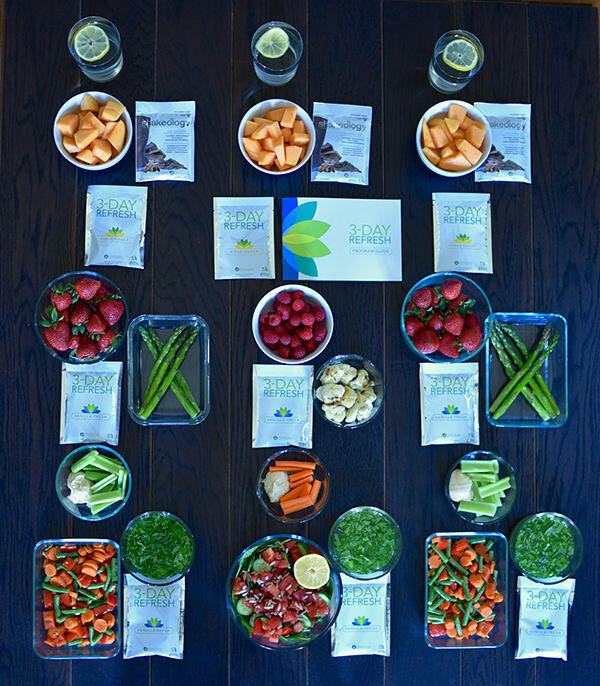 Now, put together the afternoon snacks. Cut 4 stalks of celery ribs, and cut the reserved half of the carrot into matchsticks. Divide the celery between 2 small food containers, and place the carrots in another container. Add 2 Tbsp. of hummus to each dish. Place in the refrigerator. If you’re going to include the optional vegetable broth in your 3-Day Refresh menu, fill three food containers with 1 cup of broth each. Add up to ¼ cup fresh herbs, like chopped parsley or cilantro. If you purchased a whole cantaloupe, cut it into cubes so that you have 3 cups of cut fruit. Divide evenly between 3 food storage containers or small plastic bags, and place them in the refrigerator. You’re already finished! 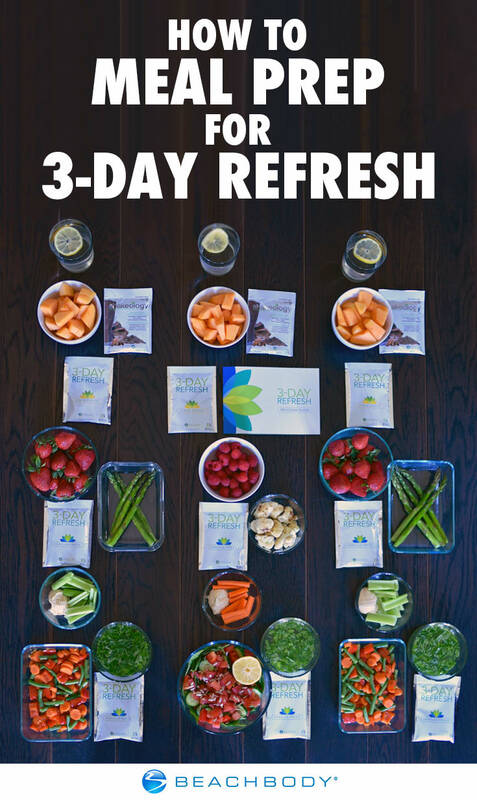 Now enjoy your 3-Day Refresh! Arrange 10 asparagus spears on a baking sheet, drizzle with 2 tsp. olive oil, and season with Himalayan salt if desired. On the same baking sheet, place ¾ cup of cauliflower florets and drizzle with 1 tsp. olive oil and a dash of ground cumin. Place the baking sheet in the oven for 20 minutes or until vegetables are tender-crisp. Remove from oven and set aside to cool for 20 minutes. Divide asparagus evenly between two food storage containers, and place cauliflower in another container. Place containers in the refrigerator. In a large food storage container, place 2 cups baby spinach, ½ cucumber, ½ red bell pepper, ¼ cup sprouts, and ½ of a tomato. Top with 1 tsp. sunflower seeds, and place half a lemon in the dish. When you’re ready to eat, squeeze the lemon over the salad as a dressing.